GCE was contracted by a private company to do a feasibility study for a 2,000-acre tract located in Castle Rock, Colorado. to do a feasibility study for a 2,000-acre tract located in Castle Rock, Colorado. The proposed development consisted of single family and multifamily homes, commercial properties, office buildings, and open space. Work included data collection, assessment of existing conditions, and a development feasibility study. Based on market studies and a client’s vision of providing housing for a wide range of socio-economic groups, GCE conducted a study on various development mixes that included single family (both large estate type and densely populated) lots, multifamily lots, apartments, mixed use developments comprising retail ground floor units with residential units at higher levels, as well as commercial reserves. Preliminary project layouts were developed for approximately 6000 residential units. The layouts with planned uses, mobility and road network, development staging considerations, reserves for public use, environmentally sensitive areas, and drainage and utilities. 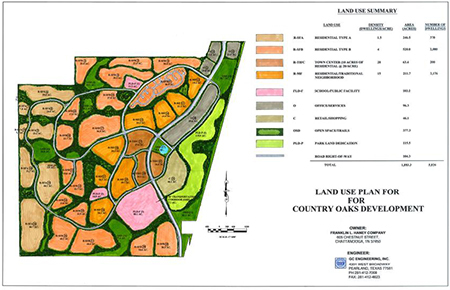 A land use summary and design report were prepared considering various development scenarios. This also included tabulation of various land uses based on the market studies performed, recommendations for development phasing, and site access. GCE performed preliminary drainage analysis to determine the storm water collection and conveyance requirements by reviewing FEMA flood insurance rate maps for the project area to determine floodplain information within and in the immediate vicinity of the project site, determining specific floodplain management requirements for the area of the development, determining the order of magnitude requirements for storm water detention, water quality, and floodplain fill compensation, locating appropriate area(s) within the project site for detention ponds, and performing schematic design to determine the pond geometry. GCE also reviewed options available to fulfill utility needs for the development, including available utility options for water and sanitary sewer, by assessing approximate ranges of water and sewer demand in the development mix and preparing a report on site water and sewer utilities. Work also comprised preparing master drainage plans, master sanitary sewer plans, and master water plans. Based on the above studies, GCE also prepared an order-of-magnitude construction cost estimate for the development of infrastructure.